You can use the projector's Edge Blending feature to create a seamless image from multiple projectors. Select the Extended menu and press Enter ( ). Select the Multi-Projection setting and press Enter ( ). 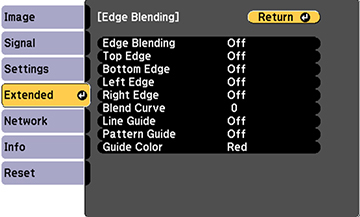 Turn on the Edge Blending, Line Guide, and Pattern Guide settings. Select the Blending setting and select On. Select the Blend Range setting and use the arrow buttons to select the width of the blended area so that the displayed guides are at the edges of the overlapping area between the two images. Press Esc to go back to the previous screen. Select the Blend Curve setting and select a gradient for the shaded area on the projectors. 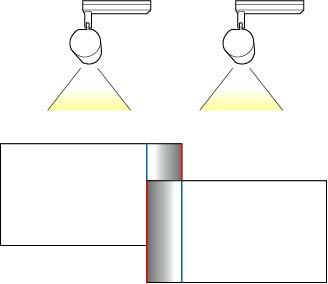 When the edges are blended, turn off the Line Guide and Pattern Guide settings on each projector to check the final settings. When you are finished, press the Menu button.